Teachers use different strategies to help students learn. With the inevitable arrival of the Common Core State Standards, however, the big unknown is what will happen when the assessments are released and the states and the federal government develop policies to accommodate them. If the assessments fall back on the kinds of narrow questions we saw with No Child Left Behind, and if governments create the same kind of high-stakes accountability, teachers will be herded back towards lower levels of prescriptive learning that leave little room for student voice and ownership. But if assessments mirror the broad principles and effective pedagogy that the CCSS authors have championed, there is hope that rote learning and teacher-driven classrooms will not be necessary in order for students to pass the test. Most student-driven classrooms start with a question. It’s usually one that springs from a common place but allows for individualization by students based on their interests. It allows them to build questions and go about answering them, utilizing the skills and knowledge that the curriculum provides. The teacher facilitates this learning, to be sure, but also gives authority to the student to “own” their question. The student moves to center stage and the teacher assumes a supporting role. Three of the eight mathematical practices that lie at the heart of all the Common Core’s K-12 math standards could be statements that describe a student-centered classroom. For example, the capacities stated in the CCSS to “make sense of problems and persevere in solving them,” “reason abstractly and quantitatively,” and “construct viable arguments and critique the reasoning of others” are all integral to successful units where students ask and answer their own questions — and to a classroom where they see their viewpoint as valuable to the educational process. The “tension” will come when the the goal of student-driven learning bumps up against the traditional teacher’s instinct to provide the context and the questions for students to use. Especially in the beginning years of CCSS implementation, this tension will be heightened as teachers learn what they are expected to teach (not just content but things like “sense-making, “reasoning,” and “constructing”) but have not yet figured out the places where they can turn the reins over to students. HOW DO WE TEACH PERSEVERANCE? A key CCSS principle (Math Practice MP1) is to “make sense of problems and persevere in solving them.” The alignment between student-driven learning and CCSS is very close here. Student-driven learning revolves around identifying problems that students believe are important to them and applicable to their real life, and then finding ways to solve them. The CCSS encourages teachers to help students “find the meaning of a problem and look for entry points…analyzing givens, constraints, relationships and goals.” If a teacher has already established (or begun to establish) the student-centered classroom, this will be familiar territory. Through artful inquiry-based instruction, teachers can co-learn along with students by gently guiding and providing probing questions of their own. We have to be patient as our kids gain the ability to do this. Students who have spent years in NCLB classrooms will struggle to find how to make sense of problems. Why? Simply because they have seldom been presented with complex scenarios. The deeper student learning that can emerge from this style of teaching can’t be assessed with a multiple choice question. So we haven’t encouraged teachers to become skillful in this way, and we’ve raised a generation of rote learners. Even so, our students can reconnect with their innate curiosity and excitement about learning. Over the past several years of shifting my practice, I have seen their natural curiosity return. When it does, persevering isn’t nearly so hard. Until it does, teachers will have to continually re-assure and support students in building deeper, higher level kinds of questions. Within the first ELA strand, writing, the Common Core articulates steps for writing a good argument and defending it. Details about how these skills are going to build up from lower grades (with increasing amounts of sophistication) are not present in the standards. That will fall to the collective expertise of teachers working together to make this happen, and to curriculum writers at the district or state levels. We will have to work at understanding what kinds of vertical alignments are needed so we can craft lessons to be matched with our students’ needs at each level. Common Core writing standards appear to emphasize “the ability to write logical arguments based on substantive claims…reasoning…and relevant evidence.” If students were able to demonstrate this ability in their writing, they would be able to describe and defend their ideas to others. And that empowering skill set is exactly what a student-driven classroom seeks to achieve. More tension will arise for traditional teaching as educators are called upon to expand the student’s understanding of non-fiction and technical topics, like those associated with STEM subjects and social sciences. 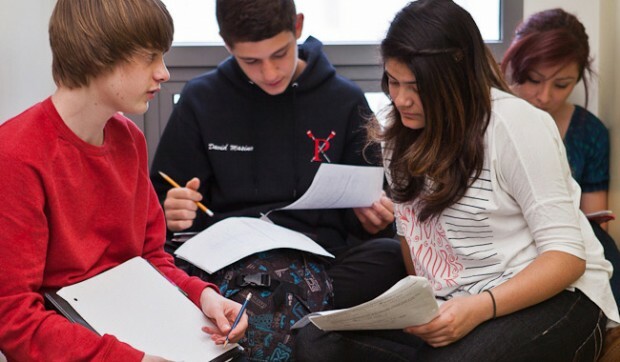 In recent years, students have been heavily focused on writing narrative and creative writing kinds of pieces. The expansion of real-world study topics called for in the Common Core should open up the student-driven classroom even more. Writing’s partner is speaking and listening. In a student-driven classroom, there is much “argumentation, debate and discourse” as students wrestle with the questions. The best of those classrooms foster respect between students as they learn from each other. They have to develop the ability to hold their own during small group discussions as well as classroom discussions. What should please teachers is the fact that the CCSS standards address the formal, stand-in-front-of-the-class presentation and the collegial discussions between students. When I read about “….informal discussions that take place as students collaborate to answer questions, build understanding and solve problems,” I see support of student choice. These words underscore the importance of students’ conversations about what they are learning and the interpersonal skills that are necessary for undertaking co-learning of ideas and content. Building understanding and solving problems are goals that demand we address the group dynamics involved in studying a real-world situation and brainstorming ideas back and forth. Ultimately there is room in the Common Core’s vision and principles for advocates of student-driven learning to thrive. As teachers gain experience in the CCSS standards that apply to their grade level, they will identify places where there are opportunities to put student questions at the forefront of their lesson plans. Over time, as students build up their ability to read, write, speak and find solutions to increasingly more complex kinds of problems, they will be able to take more and more ownership of the learning process. All this assumes, of course, that the large-scale assessment and accountability systems are designed to promote this potentially powerful marriage of the Common Core and student-driven learning. I’ve been teaching a long time. I know how big that assumption is. But at the classroom level, the best way I know to make it happen is to show what could happen. So I’m going to keep doing that. Marsha Ratzel is a National Board-certified teacher in the Blue Valley School District in Kansas, where she teaches middle school math and science. Her book about shifting her science teaching practice to emphasize student-driven learning will be published this spring by Powerful Learning Press. A portion of this post originally appeared on Voices from the Learning Revolution.